Every lidar point can have a classification assigned to it that defines the type of object that has reflected the laser pulse. Lidar points can be classified into a number of categories including bare earth or ground, top of canopy, and water. The different classes are defined using numeric integer codes in the LAS files. Classification codes were defined by the American Society for Photogrammetry and Remote Sensing (ASPRS) for LAS formats 1.1, 1.2, 1.3, and 1.4. ArcGIS supports all versions of LAS. LAS version 1.4 is the latest LAS version and adds additional point classification and information. The Filters group on the Appearance tab allows you to change the display of the data contributing to the LAS dataset in ArcGIS Pro. A LAS dataset can reference many LAS files and surface constraints. You can adjust which lidar points and surface constraints are drawn using the Filters group. The Filters group contains LAS Points and Surface Constraints filters. The LAS Points and Surface Constraints buttons provide quick access to the LAS dataset Layer Properties. Once the filter options have been chosen, any further analysis or symbology changes will honor the selected filters. Follow these steps to access the LAS dataset Filters group. Select a LAS dataset layer in the Contents pane. On the Appearance tab, in the Filters group, click the desired LAS dataset filter option or options. The same filter options also apply to a single LAS or ZLAS file. A lidar pulse can be reflected from one or many features and can therefore return more than one laser pulse. You can use these separate laser pulse returns to display the lidar data referenced by the LAS dataset. The most common filters are Ground and Non-Ground, basically meaning ground laser returns and feature laser returns, respectively. Being able to separate out lidar data based on different laser returns allows you to analyze and visualize lidar data quickly and efficiently for various applications. 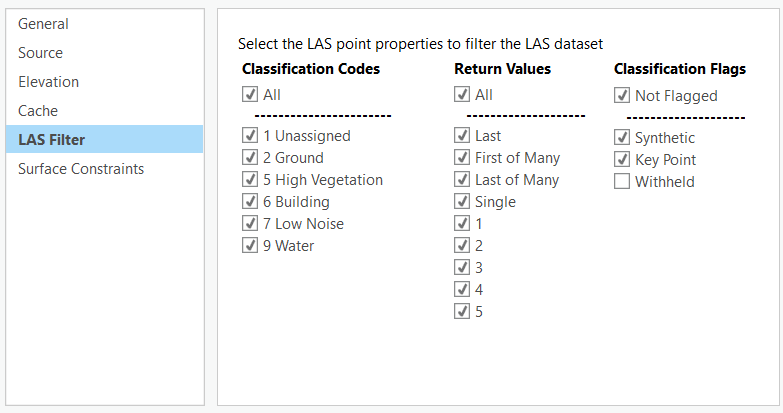 The LAS Points filters drop-down menu provides a quick way to access common lidar filters. There are several other options available in ArcGIS Pro to filter lidar data referenced by the LAS dataset. Use the LAS Filters on the Layer Properties for more advanced point filter options. Use all the lidar points to display the LAS dataset. Use only the lidar points flagged as ground points to display the LAS dataset. Use all the lidar points that are not flagged as ground points to display the LAS dataset. Use only first-return lidar points to display the LAS dataset. An emitted laser pulse can have several returns depending on the features it is reflected from and the capabilities of the laser scanner used to collect the data. The first return will be flagged as return number one, the second as return number two, and so on. The filters that are selected can be applied to the LAS dataset displayed either as points or as a surface. 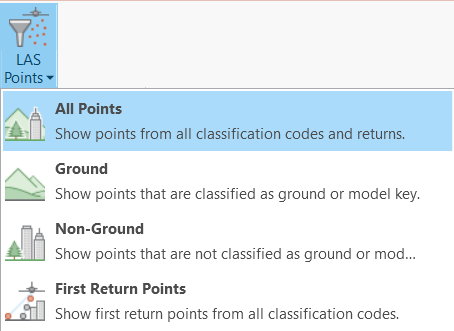 The Classification Codes, Return Values, and Classification Flags can be used to filter the points for display and analysis. Click the LAS Points button from the Filters group to open the LAS Filters on the Layer Properties. Click the appropriate check boxes to display the desired LAS dataset filter options. Every lidar point that is postprocessed can have a classification that defines the type of object that has reflected the laser pulse. Lidar points can be classified into a number of categories, including bare earth or ground, top of canopy, and water. The different classes are defined using numeric integer codes in the LAS files. An emitted laser pulse can have up to five returns depending on the features it is reflected from and the capabilities of the laser scanner used to collect the data. The first return will be flagged as return number one, the second as return number two, and so on. When a classification is carried out on lidar data, points may fall into more than one category of the classification. Classification flags are used to provide a secondary description or classification for lidar points. For example, a lidar return from water may need to be removed from the final output dataset, but it still should remain and be managed in the LAS file as a collected lidar point. With LAS version 1.0, a lidar point could not simultaneously maintain two assigned classification attributes. In later versions (LAS 1.1, 1.2, 1.3, and 1.4), classification flags could be used to solve this problem. Synthetic, Overlap, Key Point, and Withheld flags can be set for each lidar point. These flags can be set along with the classification codes. Surface constraints are surface features stored in either geodatabase feature classes or shapefiles, which are usually derived from some sort of remote-sensing technique such as photogrammetry. If you have added surface constraints to your LAS dataset, you can quickly turn them on or off. Click the Surface Constraints icon from the Filters group to open the Surface Constraints options on the Layer Properties. Check the appropriate check boxes to turn the desired surface constraints on or off.